The following are the latest results contributed by HM Courts Service, for cases sentenced by West Sussex Magistrates’ Court sitting at Worthing and South East Hampshire Magistrates’ Court sitting at Portsmouth from January 23 to 27, 2017. Peter Grant, 42, of Purbeck Place, Littlehampton, was given a community order with Rehabilitation Activity Requirement after being found guilty of burglary, entering Sussex Asphalt, Portslade, as a trespasser and stealing lead and a drill worth a total of £200 on April 17, 2014. He must pay £200 compensation, £85 victim surcharge and £350 costs. 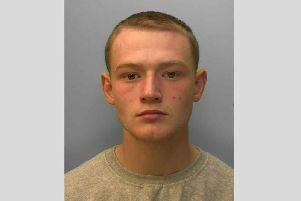 Adam Stepney, 19, of Queen Street, Littlehampton, was given a community order with Rehabilitation Activity Requirement and must carry out 150 hours’ unpaid work after admitting two charges of using threatening words or behaviour with intent to cause harassment, alarm or distress in Goring, on September 9, 2016, and one on October 8, 2016. He must pay £85 victim surcharge and £85 costs. Peter Watkin, 68, of Stroudley Court, Sheep Fold Avenue, Rustington, was given a 12-week prison sentence, suspended for 12 months, after admitting four charges of committing an act of outraging public decency by filming up a female’s skirt without their knowledge. He must pay £115 victim surcharge and £85 costs. Julijs Andrianovs, 34, of Roundstone Drive, East Preston, was fined £60 after admitting drug-driving (800ug/L benzoylecgonine) in Pevensey Road, Bognor Regis, on November 29, 2016. He was disqualified from driving for 12 months. He was also fined £60, must pay £30 victim surcharge, £85 costs, and was disqualified from driving for 12 months after admitting drug-driving (78ug/L cocaine) in Pevensey Road, Bognor Regis, on November 29, 2016. Diana Bennett, 46, of East Street, Amberley, was given a community order with Rehabilitation Activity Requirement and must pay £85 victim surcharge, £85 costs, after admitting being in charge of a motor vehicle while over the drink-drive limit (125mg of alcohol in 100ml of breath) in Kithurst Hill car park, Storrington, on January 4, 2017. She was disqualified from driving for six months. Adam Conway, 29, of Cranworth Road, East Worthing, was fined £1,000 and must pay £100 victim surcharge, £85 costs, after admitting being in charge of a motor vehicle while over the drink-drive limit (232mg of alcohol in 100ml of blood) in Shelby Road, Worthing, on November 27, 2016. His driving record was endorsed with ten points. Michael Harris, 27, of Orchard Road, East Preston, was given a restraining order and fined £120 after admitting using threatening words or behaviour with intent to cause harassment, alarm or distress in East Preston on January 5, 2017. He must pay £30 victim surcharge and £85 costs. He also admitted possessing cannabis, no separate penalty. Neil Kelsey, 57, of Adur Valley Court, Towers Road, Upper Beeding, was fined £120 and must pay £30 victim surcharge, £85 costs, after admitting drink-driving (68mg of alcohol in 100ml of breath) in Manleys Hill, Storrington, on January 4, 2017. He was disqualified from driving for 18 months. Kerry Peacock, 37, of Hurstfield, Lancing, was discharged conditionally for 18 months and must pay £240 compensation after admitting criminal damage to a car in Shoreham on December 9, 2016; and using threatening words or behaviour with intent to cause fear of violence in Shoreham on December 9, 2016. Shaun Bashford, 20, of Patching Close, Goring, was fined £220 and must pay £30 victim surcharge, £85 costs, after admitting drink-driving (65mg of alcohol in 100ml of breath) in West Park Lane, Goring, on January 7, 2017. He was disqualified from driving for 18 months. Stanislaw Budz, 29, of Cobham Close, Yapton, was given a community order and must carry out 140 hours’ unpaid work after admitting drink-driving (95mg of alcohol in 100ml of breath) in Hotham Way, Bognor Regis, on January 8, 2017. He must pay £85 victim surcharge, £85 costs, and was disqualified from driving for 24 months. Rhys Dawson, 22, of Test Road, Sompting, was fined £140 and must pay £30 victim surcharge, £85 costs, after admitting, drink-driving (54mg of alcohol in 100ml of breath) in Crabtree Lane, Lancing, on January 7, 2017. He was diqualified from driving for 15 months. Amy Lloyd, 32, of Pebble Way, Shoreham, was fined £80 after admitting possessing cannabis in Pebble Way, Shoreham, on January 7, 2017. She was also fined £120 and must pay £30 victim surcharge, £85 costs, after admitting assaulting a police constable in Pebble Way, Shoreham, on January 7, 2017. Steven Marley, 48, of West Way, Lancing, was given a community order and must carry out 100 hours’ unpaid work after admitting driving an electric scooter while disqualified in Elm Grove, Lancing, on July 28, 2016. He must pay £85 victim surcharge, £85 costs, and was disqualified from driving for three months. He also admitted driving without insurance, no separate penalty. Lucy Sterk, 31, of Ash Lane, Rustington, was given a 12-week prison sentence, suspended for 12 months, and must carry out 200 hours’ unpaid work after admitting drink-driving (145mg of alcohol in 100ml of breath) in Albert Road and Mill Lane, Rustington, on January 5, 2017. She must pay £115 victim surcharge, £85 costs, and was disqualified from driving for 34 months. Jane Thomas, 55, of Winterbourne Close, Durrington, was given a community order and must carry out 100 hours’ unpaid work after admitting failing to promptly notify Worthing Borough Council of a change in circumstances, namely employment, affecting Housing Benefit between August 12, 2013, and September 21, 2015. She must pay £85 victim surcharge and £85 costs. Dovile Narutyte, 27, of Pilgrims Walk, Tarring, was fined £120 and must pay £30 victim surcharge, £85 costs, after admitting being drunk and disorderly at Broadwater Bridge on January 11, 2017. Stuart Sheffield, 39, of Milton Road, Worthing, was given a 24-week prison sentence, suspended for 18 months, and must carry out 200 hours’ unpaid work after admitting theft by finding, stealing a gold and diamond ring worth £3,000 in Worthing on or before July 23, 2016. He must pay £3,000 compensation, £115 victim surcharge and £85 costs. Altin Susuri, 30, of Byron Road, Worthing, was fined £150 and must pay £30 victim surcharge, £85 costs, after admitting drug-driving (2.3mg Delta-9-THC per litre of blood) in Ann Street, Worthing, on November 28, 2016. He was disqualified from driving for 12 months. Steven Marley, 43, of Sea Lane, Goring, was fined £100 and must pay £30 victim surcharge after admitting driving over the 40mph speed limit in Beaulieu Road, Lyndhurst, on July 12, 2016. His driving record was endorsed with three points.